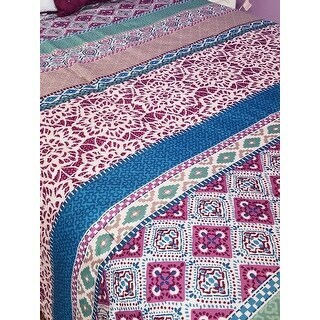 Absolutely love this bed set, it is soooo soft! The bedspread is just the right thickness, so you can use it year round. The colors are also very vibrant. Give your bedroom a bohemian update with the Intelligent Design Adley Comforter Set. Featuring gorgeous hues of coral, yellow, turquoise and grey, this color combination enhances the intricacies of the global inspired pattern showcased throughout the comforter. A decorative pillow with an embroidered medallion adds the finishing touch and brings the whole look together. Set includes one comforter, two matching shams(one in Twin/ Twin XL), two decorative pillows. This comforter is great. Nice quality, beautiful colors. My daughter loves it! This set is a wonderful addition to my guest room. It is true to color with beautiful, rich shades of purple and blue throughout. Very nice quality set. Have not washed yet, so cannot comment on steadfastnesss of color post cleaning. I purchased this for my granddaughter. It is a very beautiful set for a teen. The design is perfect. I really like the bold purple accent design throughout the design. Set is machine washable and held up well after several washings. I brought this Adley Purple Comforter Set for my daughter and she loves it. She loves the color purple and with this color and the tans and the blues it is versatile and can be matched with other colors. It really adds color to her room, and I haven't heard any complaints. 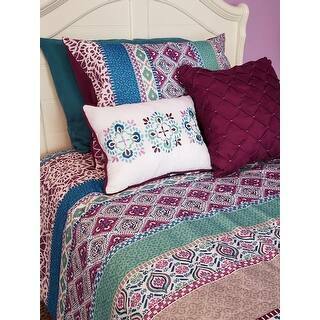 This gorgeous bedding set has quickly become a fan favorite! I love the purple colors and it looks so great in my daughter's room. Everyone who sees it exclaims hour beautiful it is. I also love how the decorative pillows really seem to complete the look and bring it all together. I just wish there were more coordinating items like curtains or a bed skirt. But overall I am very pleased with this item. Bought this for my granddaughter for Christmas and she was absolutely thrilled! She had looked everywhere trying to find these colors to match the new color scheme in her room and had about given up. The fabric can be very warm in the winter when combined with a blanket and cool in the summer when used alone. She is especially found of the designer pillows that came with it. Grandma to the rescue. Thanx Overstock! Silky feel to the comforter. Light but substantial and went perfectly with the regal lace sheet set in purple that I purchased to go with it. The pillows are cute & the sham is well made.. I purchased this for my daughters college apartment and was pleased with the quality. It looks just like the picture. The colors are pretty and world well in her room. This quilt is not too heavy. It's just right. The colors are beautiful for my daughter. It is a gift so she doesnt have it yet. Yes I would recommend it to otherd. Gorgeous colors! We were looking for a mix of purple and dark teal and this is a lovely pattern. The throw pillows complement the set and look really nice together. Colors are beautiful. Brighten up a room with the warm purple and pink boho pattern. My daughter loved her new bedding!! The colors are fun and vibrant. This set had all the colors my daughter asked for. Fast shipping! Would buy again. Totally recommend for the tween in your life. Beautiful colors great quality my granddaughter loves it. This is everything I was hoping for. My daughter 7, loves it too! The colors are so bright, vivid and gorgeous. I paired with 1800 series sheets in teal. LOVE THIS! "I need a bedskirt, would teal be the best?" This comforter has purple, blue, turquoise and grey. It's a gift for my granddaughter...good price & has her favorite colors in it. "Do you know if this set would go with the purple in this carpet below from Overstock? Safavieh California Cozy Solid Purple Shag Rug (6'7 x 9'6) Option - SG151-7373-7 Item - #13945636 ***"
In my opinion, they would work together.